Haley Seanor grew up in the small east Texas town of Mineola. She attended Baylor University where she received a Bachelor of Fine Arts in Graphic Design. She remained at Baylor for graduate school, receiving her M.Div. with a concentration in Spiritual Formation from Truett Theological Seminary. During her last two years of seminary, Haley was the chaplain of South Russell Residence Hall. It was during this time that her passion for ministry began to take shape. She is excited for this new chapter of growth and discernment, as she serves in the hospital setting. 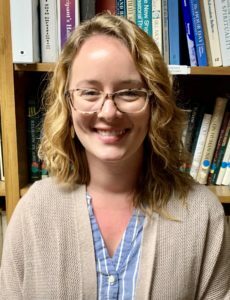 Haley and her husband, Zachariah, moved to Birmingham in 2016 when he joined the staff of the Woman’s Missionary Union. Haley enjoys traveling, cooking, and snuggling up by the fire with a hot cup of tea.